Some of us went on a tour to 500-year-old Suzhou in China's fabled Silk Region. This is the city of silk, gardens, and canals that inspired Marco Polo. We went there by train. Suzhou lies approximately 100 km west of Shanghai and its old town with many canals, hump-backed bridges and white-washed houses is known as the Venice of the East to this day. While making a daytrip to Suzhou, you cannot miss what this city is primarily known for: its plethora of beautiful gardens. 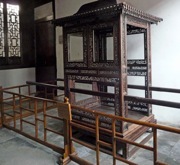 Many of these originally over 100 gardens, which are a legacy of Suzhou's past community of artists, merchants and scholars, are still in existence today. You can also expect to delve into the city's history of silk production and embroidery while visiting one of the many silk factories. Suzhou means “Plentiful Water”, and its Grand Canal is crowded with strings of barges laden with fruits, vegetables, construction materials, and coal. The Grand Canal, second only to the Great Wall as a Chinese engineering feat, was begun 2,400 years ago. Graceful bridges cross over the water, and the tile-roofed white-washed houses sit close to shore. 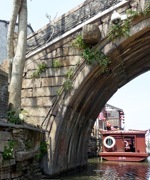 We took a short ride from the train station to the waterfront, and then cruised the canal to the Water Gate, which connects Suzhou to the southern end of the canal and was used as a “toll gate” for the canal's commercial traffic. We frequently saw people washing their laundry or fishing along the banks of the canals. A small village not far from Suzhou city. It is a typical scene of whitewashed brick buildings in a place where boats are still an important source of transportation. Suzhou, in the southeast of Jiangsu Province, is situated on the plains of the Changjiang River (Yangtze River) Delta. 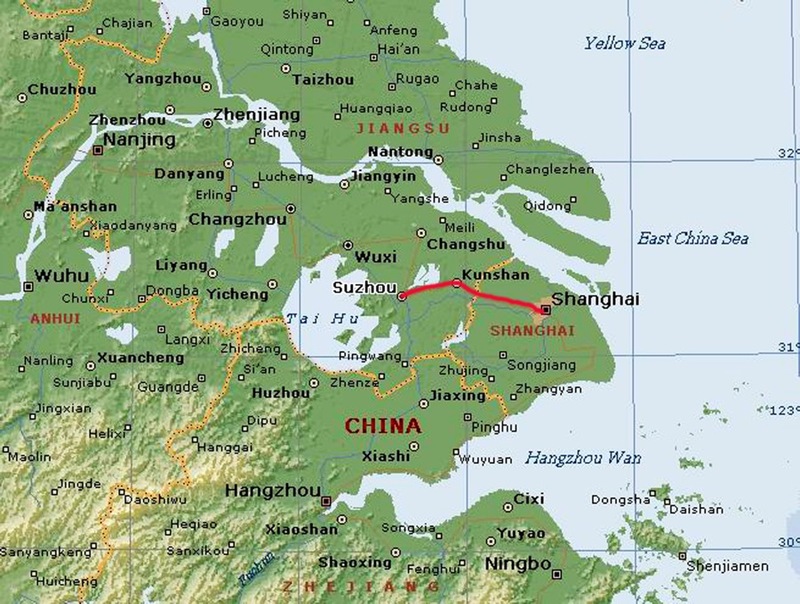 It connects to the east with Shanghai, and to the west with Nanjing. The ancient Grand Canal flows through the boundaries of the city while Lake Taihu irrigates the farmland around. Waterways crisscross the city proper and a network of rivers covers the outskirts, making the area a typical "land of waters." 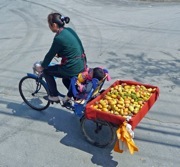 Famed as the "Venice of the Orient," Suzhou has a mild climate, fertile land and abundant products. It has long been known as the "land of fish and rice." Suzhou has a subtropical climate with four seasons. The annual average temperature is 61 F and the average precipitation is 45 inches. Suzhou is an ancient city with a history of more than 2,500 years. According to historical records, the State of Wu was established near Suzhou around the 10th century B.C. 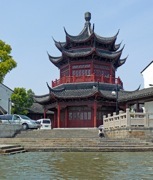 (Even today, Suzhou is still dubbed "Wu" for short). In 560 B.C., Zhu Fan, King of the State of Wu, moved his capital to Suzhou. From then on, Suzhou began to take an increasingly important place among the cities south of the Yangtze River. In the Ming and Qing dynasties in particular, Suzhou reached dazzling height of prosperity, as it gradually became the center of the silk industry in the whole country. Suzhou was once a typical consumer city. The past 30 years or so, however, have witnessed remarkable development in Suzhou's industry and the city now boasts more than 580 industrial enterprises. New industries such as the metallurgical, chemical, machine building, electronics and optical instruments industries have sprung up and expanded. The traditional silk industry has also made great progress and formed a fairly complete system encompassing reeling, dyeing, weaving and printing. Suzhou used to rely almost entirely on water transport. Railways and highways have been constructed, however, and the city now possesses a good transportation system. The Beijing-Shanghai Railway passes through Suzhou and a complex highway network stretches out from Suzhou to other places within and outside the province. Suzhou is the "City of Gardens." Since ancient times, a saying has described the gardens south of the Yangtze River as the "finest under heaven" and singled out those of Suzhou as the most remarkable among them. The exquisitely designed gardens of Suzhou represent the cream of classical south China landscape gardening. Simple and elegant in style, they differ from Chinese imperial gardens that tend to stress pomposity and display. From the Song Dynasty (10th century A.D.) onwards, the richness and beauty of Suzhou became a great attraction to many high officials and landlords. Craftsmen were ordered to build tasteful garden villas for them. In the Ming and Qing dynasties, from the 14th century right up to the early 20th century, the city accumulated more than 200 villas and gardens belonging to high officials or wealthy people. At present, more than a dozen of the better-known gardens have been restored and opened to the public. All are typical of ancient landscape gardening south of the Yangtze River. On the eve of liberation, most of the gardens were in a dilapidated state. Subsequently, the People's Government designated these gardens as cultural relics to be protected by the state. Funds for repair and restoration were appropriate and thus, an invaluable part of Chinese cultural heritage, famous both at home and abroad, shines once again in its former splendor. TongLi is a 40 minute drive from Suzhou. It is known as Little Venice because of its extensive canal system. You can take boat rides if you want. Notice the fishing cormorants. We drove to a silk factory where we watched the silk cocoons being boiled and the silk spun into fine threads. We saw how silk is made from mulberry-munching silkworms to thread to fine cloth. Marco Polo reported that so much silk was produced in Suzhou that every citizen was clothed in it. At one time Suzhou guarded the secrets of silk making so closely that smuggling silkworms out of the city was punishable by death. 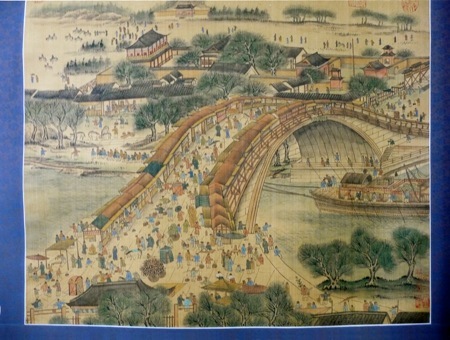 We also saw a painting of the same scene that is on the silk rug that Arthur and I had bought in Shanghai. As far back as 2640 BC, Empress Si Ling Chi encouraged the cultivation of mulberry trees and silkworms. The production of silk has always been a high priority in China. First, it had an imperial patronage, and officials wore silk robes, which probably led to its standard usage during the Han Dynasty. The advantage of silk over the more commonly-used plant fibers such as hemp, nettle and grasses, was that silk threads were naturally long and could be easily be woven into a fine material. The finished material was very strong and could also be stretched. It absorbed dyes well and was comfortable to wear. The most common colors were brown, blue, green and red. Yellow was the imperial color and could only be worn by the emperor. "Ice white" was the most treasured color, with a brilliant luster that could not be exposed to rain or sun. Sericulture (the raising of the silk worm) and silk making were kept secret until the third century AD. It was carried to Japan via Korea, and on to Turkey, Sicily, Greece and later to Italy, Spain and France. Cultivated silk is made from reeling filaments of several hundred feet of continuous length from cocoons. The adult moth lays eggs. The caterpillars hatch and are fed mulberry leaves. They grow to about three inches in length in about 28 days and increase their weight 10,000 times. They are then placed in cardboard spinning nests, where they spin cocoons. An adult can form six inches of thread per minute. The cocoon may contain up to 3,000 feet of silk. Cocoons are carefully watched so that pupa doesn't break the cocoon. Only some are allowed to develop into moths to restart the cycle. All the rest of the cocoons are heated to kill the pupae and extract the filaments. Boil off the boiling dissolves the gummy outer layer. Coarse silk, "Tussah" has a boil off of 10%. True silk is boiled off at 25%. Reeling silk from one cocoon is too fine. Reeling combines filaments from several cocoons. They are unwound in reeling basins; this is raw silk. It is then reeled into skein form. Throwing reeled silk is transformed into silk yarn or thread by "throwing," the threads together as in spinning. Soaking raw silk skeins are soaked in warm water containing soap or oil, which makes it supple. It is then dried and wound onto bobbins. Winding strands are given the desired amount of twist, sometimes are combined with two or more strands. The first stage is sorting. This woman's job is to remove any cocoons that aren't pure white. Here's the spinning wheel machine. Basically 9 cocoons each get a small thread started and the 9 threads are joined into 1 on the rotating spindle at the top. The cocoons are steamed in water before coming to this step. A worker checks that the cocoons aren't running out of silk. This worker discards the dead pupa out of the unravelled cocoons. Suzhou silk factory: One long spindle machine. There wer only 3 of these machines in the part of the factory we saw. Either that's all they had, or there were a lot more in some other off-limits section. Suzhou silk factory: There's a different process for making silk quilt filling. First the large cocoons are cracked open and the dual pupa discarded. Then the cocoons are stretched over an arch. Suzhou silk factory: After a good collection have been stretched over the small arch, they are altogether stretched over a larger arch. Suzhou silk factory: 4 workers each take a side of one of the arch-stretched cocoons. Then they pull until it completely fits over a queen-size comforter space. They do this again and again. The cocoons do not break. Suzhou CHINA: old woman Afterwards, we visited the Wangshi (Master of the Fishing Net) Garden, built in 1140 and boasting a peony courtyard that has been reproduced by the Metropolitan Museum in NYC. That evening we hear Professor Tai talk about his personal experiences during the Cultural Revolution when he was a young school teacher. To hear his remarks, and other stories of that time, please click above.